Birthday: 2nd of Winter, 515 AV. Appearance: Standing just shy of 5'2" and looking to be no more than 90lbs soaking wet, Jhale is a meek looking thing in her human form. Her long unruly hair is thick and the color of copper. Her eyes are a dark, warm brown and surrounded by thick, darker, eyelashes. 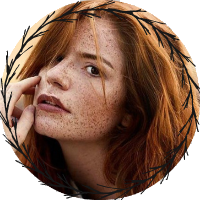 A smattering of freckles crosses her shoulders and arms, with a large amount all across her face. As with all Kelvics, she has an animal form as well, that of a Dhole. A fox-like creature with a pale off-white belly, reddish fur and a tail tipped in charcoal. She is about the size of a border collie or a medium sized dog. Her limbs and back are long, giving her a sleek, almost cat like look that is typical of the common variety of Dholes. Her ears are rounded and usually kept perked up and alert to her surroundings. A long fluffy tail in a slightly more ocher tone rests behind her and is tipped with charcoal coloring, though as summer comes the color fades to a more rusty reddish grey hue and her coat tends to stay rather short unless the cold hits and then a thick under layer can grow in to insulate her. Jhale was raised around Myrians, or rather spent the first two years of her life with them. Being brought up around the culture of the fierce Myrian warriors and their Goddess-Queen helped shape her personality somewhat. While an individual with a mind of her own, and not nearly as bloodthirsty as those she was born among, Jhale did pick up some habits and traits from the culture of the Myrians such as a boldness that she may not have otherwise adopted. While not a cannibal herself, she never really thought about it as something weird, or strange. It was a part of the culture of the people she lived among. Her parents were both Myrian Tiger Kelvics bonded to a pair of Myrian Warrior sisters. While the sisters had little to do with her actual rearing, she regarded them as family, even if a bit distant. She watched them all train in combat but was never really all that interested in it, truly she seemed more interested in learning hunting and exploring the city. She just accepted the culture of the Myrians without a second thought as normal, even if not all of their customs really interested her. Being a Kelvic she grew up quickly, and was not allowed to bond for a long time, hoping she would develop her own personality and then bond to a Myrian whose talents her personality was suited for. Though she was not a fierce Myrian Tiger like her parents were, her Dhole form was relatively useful in hunting and she picked up a few things from some of the builders of Taloba, enough to know how to assemble basic structures with materials common in the jungles. There was potential for her to be a useful member of Myrian society, however the desire to bond eventually pulled her away from any desire to stay in Taloba and pushed her to try and hone her survival skills a bit more, in hopes she could leave the safety of the Myrian city and venture out to find her own path and meet someone she would want to bond with. Despite wanting to go off on her own, she is a deeply social creature and craves social interaction. In Taloba she had a few people, mostly other Kelvics like her siblings and a few Myrians from the family her parents were bonded into she would socialize as well as random strangers she would see any given day. Moving to Syka gives her an opportunity to create new friendships and potentially find a bondmate to fill that need that dragged her away from Taloba in the first place. Being that the settlement is rather small she hopes to form stronger friendships with the people here than she was able to in Taloba. The desire to be useful and find a purpose as well as a bondmate drives her. She is determined to be both a good bondmate and a useful member of society- no matter which society she ends up in, in the end. Joora and Kal were Myrian Tiger Kelvics living in Taloba with their bondmates- a pair of sisters who were respected warriors and who would go on to become officers in Myri's Army-- making that their careers. Their Kelvic companions were very close to their Myrian bondmates and the sisters encouraged the pair to breed and produce offspring. Jhale was not the first, nor the last Kelvic child from the pair of Tiger Kelvics. especially considering their main priority was to assist their bondmates in their service of the Myrian people and Myri's Army. Jhale spent much of her accelerated childhood playing with her siblings, by the time she came along there were two others and before she left another one followed. Her older siblings were an eagle, and a tabby cat. They all aged at roughly the same pace; the eldest, being the eagle, matured a little slower than his cat and dhole sisters did. But regardless the Kelvic children could not complain much about their youth, other than maybe it had been too short. Jhale often enjoyed the company of the Myrian children as well as her siblings, but her interactions with the children of Taloba was supervised and short.Her family did not want her to bond too early and stunt her emotional and mental development. So even though she craved the social interactions of others outside the family her parents were bonded to, she had to settle for family and close friends of theirs. Nevertheless she was not left bored most days. Either she had a companion to play with or some sort of task to complete. Usually some sort of "mission" given to her to teach her some sort of lesson or skill. Things like collect some sticks, and then try to build a campfire, or shelter. Always some sort of useful skill. It was through these little lessons she learned how to survive in the jungle and make due with the materials there. Of all her tasks, the ones involving her getting to go into the Jungle were her favorite- even if it was always chaperoned and she was not allowed to go very far from the walls of the city. Usually accompanied by a parent and their bondmate, or a group setting out to forage or scavenge. She also seemed to enjoy building things, even if her 'structures' were hardly stable. Over the course of her two years with the Myrians she did pick up a few things in regards to carpentry. Around the time of her second birthday, as she grew to maturity her eldest sibling, the eagle, reached maturity and picked a bondmate. He attached to a hunter in Taloba whom was skilled in falconry, and it seemed like a match made in heaven. Then her sister the cat left to join a new family when she bonded. Jhale was left the oldest remaining Kelvic child of Joora and Kal. Then they had another child, a big cat like them, but not a tiger. A jaguar. Jhale grew more and more distant from her family, though not because she was displeased or anything. She adored her new little brother and his cute little spotted animal form, no instead she felt the tug of restlessness. She needed to go find a bondmate, but nothing in Taloba seemed to call to her. She felt compelled to move on and find something new, something different. So she saved up some coin doing general labor around Taloba and with her families blessings she took off from Taloba, traveling with a small group of Myrian traders setting off to a settlement called Syka to trade. Apparently there was a group of mixed people settling on the beaches of Falyndar and they seemed open even to Myrian's. And so Jhale's curiosity urged her through a relatively rough journey from Taloba to Syka. It was during this trip she really learned a thing or two about surviving in the jungle and how tame her previous "adventures" had been. In Syka she hopes to find something to give her purpose, or at least give her a clue as to where to go next if the fit doesn't work out and if a suitable bondmate cannot be found within the population of the small settlement. Heirloom: A Short Spear made of an iron spear head and with a straight wooden staff wrapped in tanned leather strips and decorated with a few colorful feathers attached under the spear head. A gift from her mother before she left Taloba to protect her. Location: Syka, somewhere along the beach but still within close proximity to the jungle and majority of the settlement.